Rough Country is proud to release the new 4" & 6" lift kits for 88-98 GM 1/2 ton Pickup, Tahoe & Yukon. 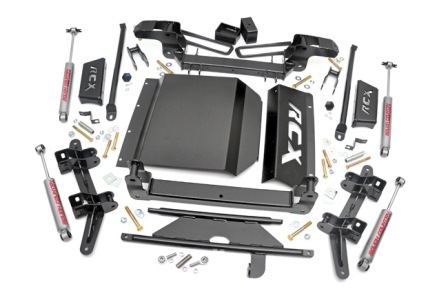 Rough Country is constantly striving for easier installations and this new revised kit is an installers dream. Shocks: Kit includes (4) Premium N2.0 shocks. Features application valved N2.0 series shock absorbers which offer the best in balanced performance for on and off road use. New Improved Design - Easier Installation! Only fits vehicle with 6 lugs. Tahoe/Suburbans require rear sway-bar links. Vehicles with Autotrac 4 wheel drive will require new aftermarket driveshaft.